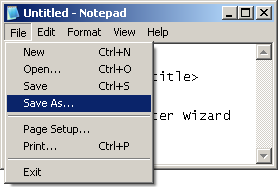 Copy the code and paste it in your favorite text editor – Notepad will do the job! Save the file as pagename.html, you can replace pagename by anything you want. Double click on the file you just saved. It’ll be displayed in your default web browser. HTML (Hypertext Mark Up Language) is the language of the web by excellence. To put it simple, HTML allows you to display data and format the way it looks (with the help of CSS). Michael is a Computer Wizard! 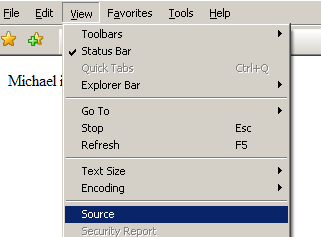 In this example, whatever you add to the HTML code and no matter how many time you refresh the page, you will not be able to change the sentence Michael is a Computer Wizard!. What if I wanted to display Mr. X is a Computer Wizard! if Mr. X visits the page? Just by using HTML, this will not be possible. This illustrates the limits of using simple HTML: data is static, which means it doesn’t change from one situation to another. 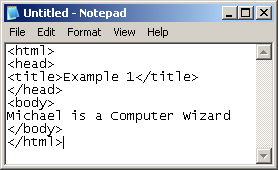 In this example, the user will enter his name in a prompt box and the message will be displayed. If Bob enters his name, the message Bob is a Computer Wizard! will be displayed. No code compilation is required. We just typed the code in a HTML file, double clicked on the file, and the browser did the rest for us. The code is executed in the user’s browsers when he opens the page. You can view the code from your browser; this operation differs from a browser to another. The two programming languages do not share the same creator or the same programming concepts. They might look similar in some cases, but their programming dialects actually differ. Except the content within the script starting (line 6) and ending (line 11) tags, the code is simple HTML which you are probably very familiar with. The <variable_name> must start by either a letter or an underscore (‘_’) and can only contain letters, numbers or the underscore character. A prompt box displays a message, an ‘OK’ button, a ‘Cancel’ button and prompts the user to input data. <display_data> is the message to display to the user. <default_data> is the default value entered by the user. The prompt function returns the value entered by the user once he clicks the ‘OK’ button. If he clicks the ‘Cancel’ button instead, null is returned. You notice, in the example, ‘Your Name’ is entered in the prompt box when the page first loads. Assuming the user enters ‘Bob’ and clicks the ‘OK’ button, the variable name will have the value ‘Bob’ after line 8. In this case the message ‘Bob is a Wizard!’ will be output. Assuming the user clicks the ‘Cancel’ button, the variable name will have the value null after line 8. In programming languages, a string is any sequence of characters (eg. ‘Duh!’, ‘Chi huaha’). A string can also be empty (eg. ”). There is only one data type called var, a variable (which we discussed earlier). In a variable, we differentiate a string from other data types by using single quotations or double quotations on both side of the value. var bob1 = “Bob rules”; Valid string assignment. var bob2 = ‘Bob rules’; Valid string assignment. var bob3 = ‘Bob rules”; Invalid string assignment: a single quotation on one side and a double quotation on the other. Strings can also be concatenated together: that is two or more strings can be attached together to form a new string. To achieve this, we use the ‘+’ operator. The operator is also used with other data types; what you need to know for the moment is that when used with strings, the ‘+’ operator concatenates. var bob4 = bob1 + bob2; Valid string assignment. bob4 will have the value “Bob rulesBob rules”. var bob5 = bob1 + ” i tell you, ” + bob1; Valid string assignment. bob5 will have the value “Bob rules i tell you, Bob rules”. var bob6 = bob1 + ” but I am” + ” da King!”; Valid string assignemnt. bob6 will have the value “Bob rules but I am da King!. var bob1 = bob1 + “: this is not true!”; Not valid string assignment: bob1 is already declared. bob1 = bob1 + “: this is not true!”; Valid string assignment. bob1 will have the value “Bob rules: this is not true!”. On line 8, name is assignned the data entered by the user. On line 9, message is assigned the data entered by the user (eg. Bill), concatenated with the string ‘ is a Computer Wizard!’ producing a new string (eg. ‘Bill is a Computer Wizard!’). <output_data> is the data to output to HTML. In Example 2, we used document.write(message); on line 10. This outputs the value of message to HTML. Let us consider some new examples in order to understand more the document.write function. “Hello There” will appear on our HTML page. The output of the page will be: 1984 in bold, then a line break, then by George Orwell in italic. You can span several lines when dealing with a string (such as on line 9-10) by using the ‘+’ operator then continuing on the next line. The ‘n’ (on line 10) is used to create a new line in the output process of the HTML code. That is, a line break will exist after the <br /> tag. You now observe how powerful the document.write function is. Credits: Michel Barakat contributed heavily to this post. There are bugs in your example2 script; maybe they are intentional so as to serve as a learning experience. I thought to check the bluehost hosting but gave up because it was so slow. I need tutorial on that or ebook. Then the script will work properly. Take care! Okay then, I give up. I guess I can’t post anything involved with j a v a s c r i p t.
Hello! Thank you for the great tutorials and resources! God bless you and your website! I’m sure it’s helped countless guests, and is bound to help more. The only “bug” in Example 2 is the first line of the script.